New technical preview, new challenges. After I got the TP1 and TP2 running on lower hardware specifications, I have tried the same for the TP3 and want to share the results with you. First of all we have the same hardware requirements for TP3 as for TP1 and TP2. 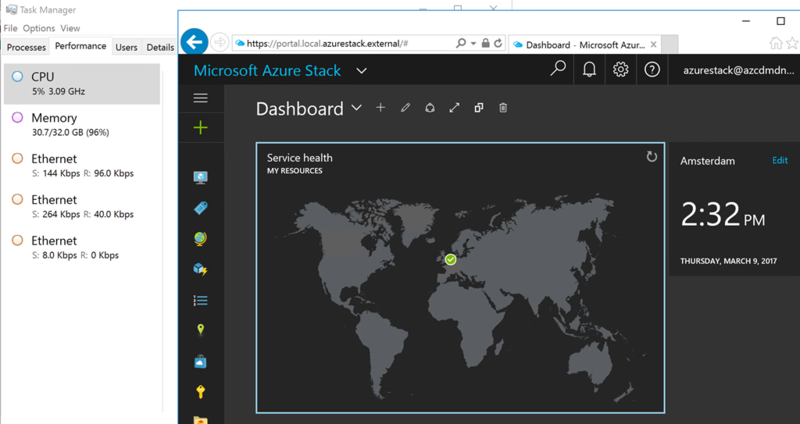 The issue with the setup is that it checks the amount of memory and CPU cores that is installed in the server and the Azure Stack Technical Preview 3 VMs have fixed configurations during the setup process. 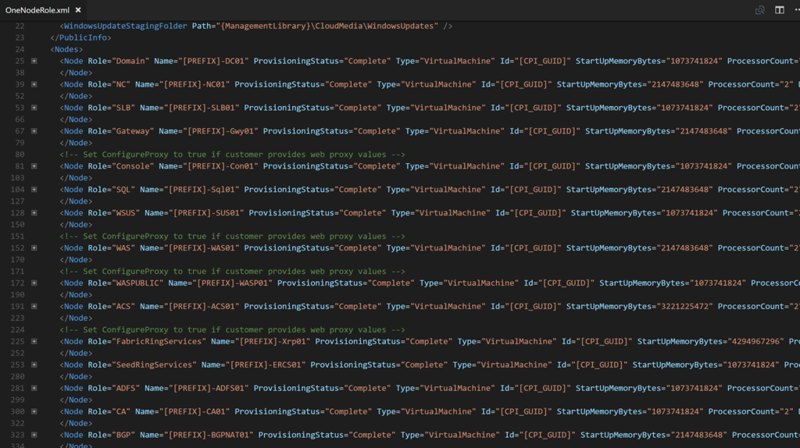 Before you can start the PowerShell deployment script you have to get the following file out of the CloudBuilder.vhdx: Microsoft.AzureStack.Solution.Deploy.CloudDeployment.1.0.381.0.nupkg. Copy the file Microsoft.AzureStack.Solution.Deploy.CloudDeployment.1.0.381.0.nupkg to a folder onto your workstation and rename the .nupkg file to .zip and extract it. Now go to the directory content. The folder structure should be familiar to you, when you have done the same configuration adjustments in Azure Stack TP2. The following two files must be edited. For the VMs I have changed vCPU and vRAM settings in the xml file to the following ones and also disabled Dynamic Memory for the VMs ADFS01, CA01 and BGPNAT01. The other VMs are using static memory. 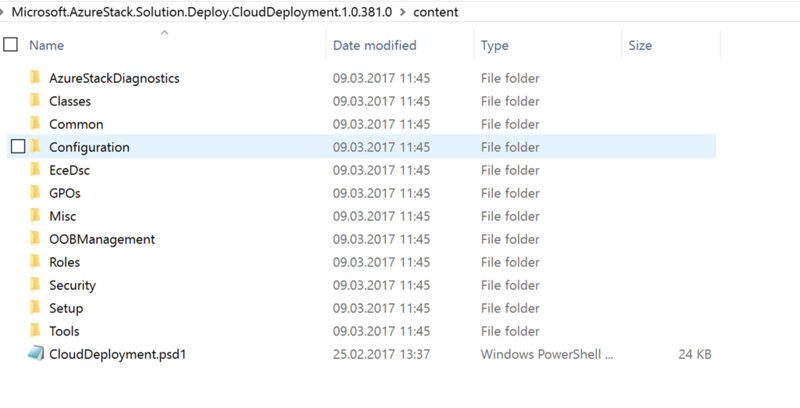 After you have edited the files, copy them back into the Microsoft.AzureStack.Solution.Deploy.CloudDeployment.1.0.381.0.zip with the Windows Explorer. Just double click on the .zip file and place the edited files into the target folders and rename the .zip file to .nupkg. Then copy it back into the CloudBuilder.vhdx. Keep in mind that TP3 has one more VM than TP2. That means the resource consumption is higher and the values have to be adjusted after the installation is completed. Otherwise you are not able to deploy any VMs, when your system has only 32 GB of memory. Yes, it is possible to run the Azure Stack TP3 on lower hardware specifications. Would I really recommend it? No! You should at least have hardware that met the minimum requirements for the Azure Stack TP3. Enough CPU power and memory is key during the deployment process.